The dramatic impact of this board makes it ideal for impression-making projects. It features the darkest, smoothest black paper, bonded front and back to a core of black polystyrene foam. It has incredible depth and richness of color - and there's no need to cover or disguise cut edges because this board is solid black through and through. 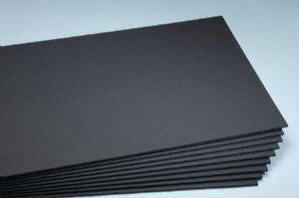 Black-on-Black® Sturdy Board® is available in various sizes.